India Sets Date For What Will Be World's Largest Vote : The Two-Way More than 800 million people are eligible to cast ballots to choose a new lower house of Parliament. The vote, which observers call a defining moment for India, will start April 7 and last nine days. 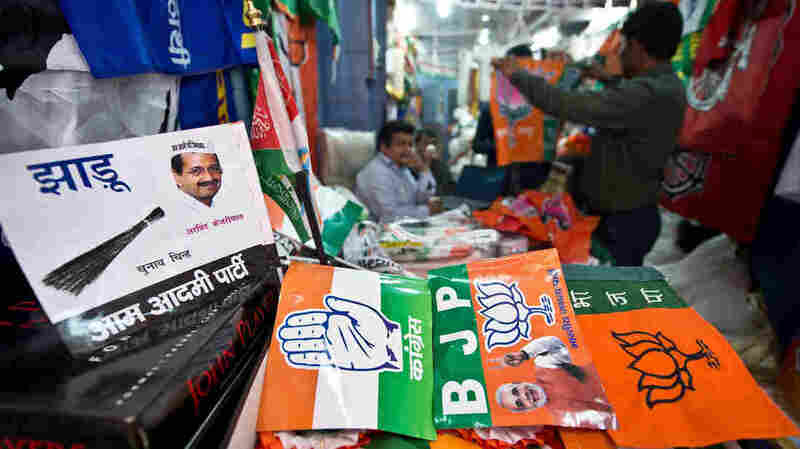 A wholesale shop in New Delhi was selling various Indian national and regional political party flags and campaign materials ahead of elections in India, the world's largest democracy. India announced Wednesday that national elections for the lower house of Parliament will be staggered over nine separate days and begin April 7. The voting to elect the 543-seat body will occur in stages to accommodate the scale of voters in what is expected to be the world's largest democratic exercise. More than 800 million people are eligible to cast a ballot to choose India's new Lok Sabha, or lower house of Parliament, that will lead India over the next five years. Camel carts will ferry voting booths across the deserts. Security forces will be deployed in Indian hotspots, including Kashmir to the north and Naxal, or Maoist, insurgent strongholds in the east.The election process is expected to last nearly six weeks. Wholesale change is on the horizon. Voters are eager for a turnaround in the sputtering economy and angry over corruption at the highest levels of government in this emerging Asian power. Analysts say the beleaguered Congress Party of Sonia Gandhi – which has been at the helm the past 10 years — looks set for a serious defeat. Rahul Gandhi, the scion of the country's fabled political dynasty, is the face of the Congress campaign but is viewed as a reluctant neophyte. A resurgent Hindu Nationalist BJP Party led by Narendra Modi is putting up a spirited challenge. Modi is leading public opinion polls despite being one of India's most polarizing figures. Critics have long blamed Modi for failing to stop Hindu-Muslim rioting in his western state of Gujarat in 2002, a charge he vehemently denies. The sectarian unrest under his watch as chief minster killed hundreds of people, mostly Muslims. Their vote is being closely watched in this election that observers call a defining moment for India. A new entrant, the Aam Aadmi Party, or "Common Man Party," could prove a spoiler to the Modi-BJP juggernaut. Aam Aadmi is gaining ground with an anti-corruption crusade that has broad appeal among the Indian electorate. Tallying the votes in the world's biggest election is scheduled to take place on one day, May 16, thanks to electronic voting machines. And in a first for a national election, Indians will have the option to reject all candidates by choosing "None of the Above."